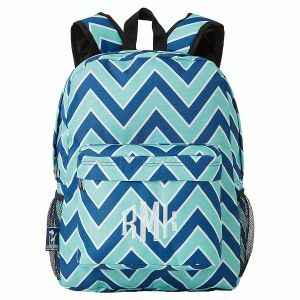 Navigating school is a breeze with these personalized chevron-print bags rendered in two striking shades of blue. Polyester backpack with padded laptop compartment, reinforced design, 3 large compartments with multiple pockets, zipper closure and adjustable comfort fit straps. Wipe clean with damp cloth. 13"L x 5"W x 16"H.